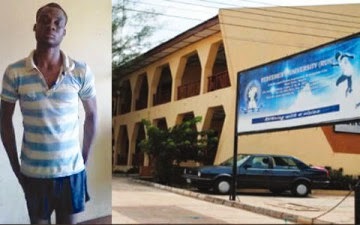 A 21-year-old undergraduate, Tolani Ajayi, of Redeemers University along the Lagos-Ibadan Expressway, has been arrested by Ogun state Police Command for allegedly killing his father, Mr. Charles Ajayi, a Senior Advocate of Nigeria. The incident, according to the police, occurred on Tuesday, July 3, at their residence on Canaanland Street within the Redeemed Christian Church of God’s Redemption Camp. Tolani was said to have slaughtered his father with a knife and later butchered him with a cutlass. In attempt to conceal the crime, Tolani allegedly packed his father’s remains in a box and dragged them into the bush within the camp. The state Police Public Relations Officer, Mr. Muyiwa Adejobi, a Deputy Superintendent of Police, said the police later recovered the remains of the 60-year-old lawyer in a bush along Canaanland Street. He said Tolani, a 300-level undergraduate in the Department of History and International Relations, was arrested the same day in his late father’s residence after the discovery of the corpse and police preliminary findings. Adejobi added that the Divisional Police Officer of the Redemption Camp Police Station, Olaiya Martins, a Superintendent of Police, had led a team of detectives and some members of the community who noticed the strange attitude of the suspect while dumping the box. He said, “They traced the ground marks made by the box to the point where the body of the SAN was dumped and thereafter traced the mark to the house of the deceased. “When the police got to deceased’s house, the suspect was in a relaxed mood. The suspect was said to have told policemen that problem arose when his late father confronted him for not responding to all the prayer points he (the deceased) was raising, adding that he (father) later slapped him. It was leant that the police had recovered the knife and cutlass used in committing the alleged crime. Adejobi told our correspondent that the Charles’ corpse had been deposited at a morgue in the Sagamu area of the state. The matter has been transferred to the Department of Criminal Investigation Eleweran, Abeokuta, for further investigation and necessary action.